Slab of limestone (209 x 54-58 x 19 cm; letter height: 4.5 cm) with acroteria above a relief of two horsemen. Found at Kerch, now in Hermitage St. Petersburg (inv. ПАН 151) See drawing by Aschik further below. Daphnos son of Psycharion, who had a role in the court. Farewell! The members of the synod (synodeitai). Δάφνε Ψυχαρίωνος | ἐπὶ τῆς αὐλῆς, | χαῖρε. | οἱ συνοδεῖται. IBosp 78: Photo from GGSR 627, plate XLII. IBosp 78: Drawing of the relief by Anton Aschik, Bosporskoji Zarstwo s jego paleografitscheskimi i nadgrobnymi pamjatnikami (Odessa: Neuman, 1848), plate XV. 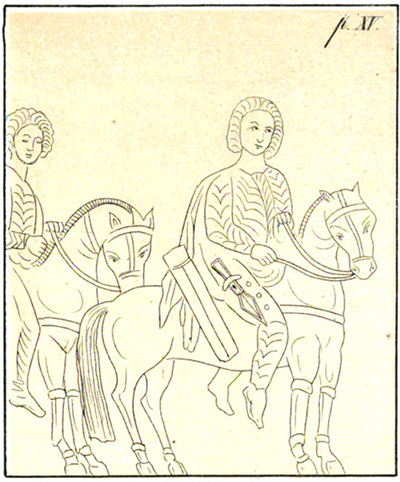 IBosp 78: Facsimile by Latyschev (IPontEux II 65).